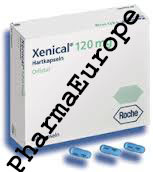 XENICAL is a prescription weight-control medication useful for the long-term treatment of significant obesity. 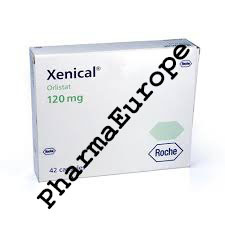 XENICAL can also help to improve risk factors, such as high blood pressure, high cholesterol and high blood sugar which, if not treated, could lead to other diseases such as hypertension and diabetes. Each XENICAL® capsule contains 120 mg of the active substance orlistat, which acts as a lipase inhibitor. XENICAL® is a weight loss medication that targets the absorption of fat in your body rather than suppressing your appetite. It is useful for long term use and has been shown to be effective for 1-2 years. Dietary fats are inhibited from being absorbed and this allows about 30% of the fat eaten in the meal to pass through the gut undigested. This helps you to reduce and maintain your weight, as well as to minimize any weight regain. Xenical is taken with each meal (three times daily). Your daily fat intake should be divided equally between these three meals so you will benefit from Xenical's actions. Your medicine should be swallowed with water. Xenical capsules. 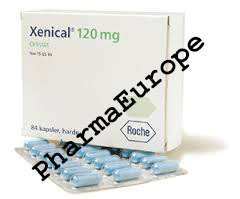 Each Xenical capsule contains 120 mg. orlistat. 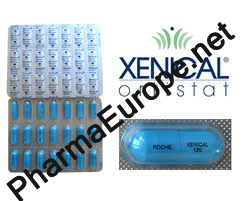 Xenical comes in packs of 84 capsules and is manufactured by Roche. Xenical achieves weight loss by using the existing fat from the body. By taking Xenical with each meal (3 times daily), Xenical allows one third of the fat to pass through the body undigested, aiding in weight loss. Health problems, such as high cholesterol, high blood pressure and diabetes, have improved with extended use of Xenical diet pills. Xenical should still be taken with a low fat diet program and fat intake should be split evenly between the 3 daily meals. With regular use, Xenical diet pills help achieve weight loss, maintain your weight loss and minimize any weight regain. Xenical has a greater success of weight loss when accompanied by a reduced calorie diet plan with no more than 30% of calories from fat. By not reducing your fat intake while taking Xenical, a greater chance of unwanted side effects such as oily discharge may occur. Individuals with a body mass index (BMI) of 30 kg/m2 or more. Individuals who have lost at least 2.5 kg body weight by dietary control and increased physical activity in the preceding month. Individuals between the ages of 18 and 75. Discontinue use of Xenical if weight loss is less than 5% after the first 12 weeks. Discontinue use of Xenical beyond 3 months only if weight loss is greater than 5% from the start of treatment. Discontinue use of Xenical beyond 6 months only if weight loss is greater than 10% from the start of treatment. Use of Xenical should not continue beyond 1 year and never beyond 2 years. The above information is intended to supplement, not substitute for, the expertise and judgment of your physician, or other healthcare professional. It should not be construed to indicate that use of Xenical is safe, appropriate, or effective for you. Consult your healthcare professional before using Xenical.